There are a lot of wasps about this spring (2014). Unless some predator kills a lot of them, or they get some horrible wasp disease there is going to be a plague of them later this year. These great big ones you see early in the year are the queens. The emerge towards the end of summer then, after mating, they overwinter in dark corners of your shed or in the hive roofs. I heard of somebody who would stack lengths of timber with little lats between them to provide tempting crevices to attract hibernating wasp queens. Once they were all tucked in and asleep – he’d go and pull all the lats out for christmas. You see them in spring as they are building their nests and before any young have hatched. Once the young emerge, they do all the work while the queen stays at home laying eggs all day – or up to common stuff like the one in the photo sticking her tongue out or scratching. The one in the photo above attracted out attention because it seemed very dark in colour – the top of its abdomen is almost sooty looking. Then we reckoned it was probably soot. Probably from prospecting for a nest site in the chimbley. Yes, we marked it but we didn’t clip it and we released it into the wild. We treated it quite well while it was with us – we kept it warm and fed it regularly with honey so we’ll be very interested to see if it comes back. Click here from more on the life cycle of wasps. This morning, 22/6/2016, I was walking in my garden when I heard buzzing, at first I thought it was a swarm but then it was a bit early in the day and too cool. I went towards the sound and there was a large bush with pink flowers just emerging covered in wasps who were working on the flowers, there was also a few bumble bees working the flowers. I dont know the name of the bush. There were very few honeybees out at the time. Any suggestions on how I can get rid of the wasps as I fear they will threaten my honeybees. Thanks. Best thing would be to keep your bees strong and narrow the entrances as soon as possible. Don’t let robbing start – it’s a devil to stop. If you set your boxes ‘the cold way’ I think that helps too – robbing wasps are then facing straight into the middle of the hive and are less able to slip in unnoticed up the front wall. Were the wasps actually working the flowers or is the bush covered in aphids? Wasps are voracious predators at this time of the year as they have carnivorous brood to rear which they feed with aphids – in return, the wasp larvae give them a sugary secretion. Yuk. They only become a pest later when the old queen goes into decline, the numbers of larvae decrease and the worker wasps lose their sense of purpose and are driven to seek alternative sources of sugar. Without the wasps you might have to resort to insecticides and we know all about the negative effects of those things. 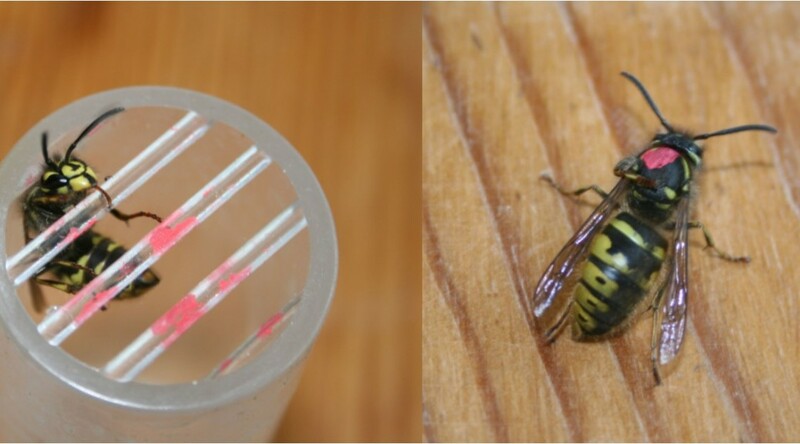 Otherwise you could set up traps but don’t put them anywhere near your hives or you will just attract wasps to them. If you found the wasps nest you might be able to destroy it if it is accessible.